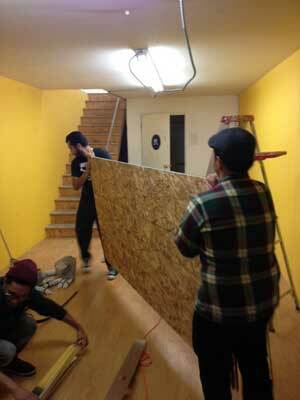 to build the new ANSWER office. 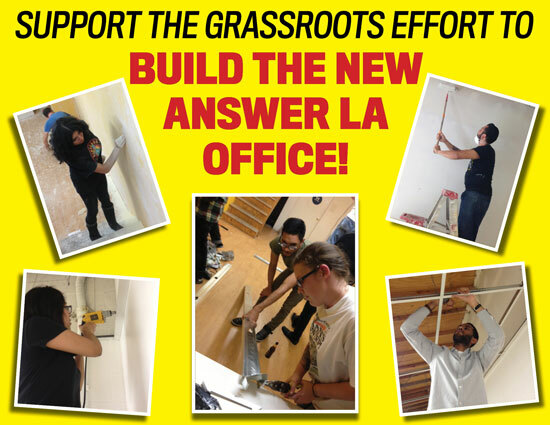 As the ANSWER Coalition moves to an exciting and dynamic new space in the heart of Downtown LA, dozens of volunteers have donated countless hours to completely renovating the office. Help them complete the job by making an urgently-needed donation to cover the cost of supplies! When the office is completed, it will offer a new hub of political activism in the heart of Los Angeles, in close proximity to important political locations such as City Hall, Pershing Square, the California State and Federal Buildings, ICE detention center, etc. As the ANSWER office on Virgil Ave did for so many years, the Downtown ANSWER office will serve as a space to put on regular public educational classes, film screenings and special forums, organizing emergency actions and mass protests against war, racism, police brutality, budget cuts and much more. To make this new hub of organizing a comfortable and attractive space, we are accruing a great deal of cost for building materials, paint and equipment rentals. You can make a vital contribution to this project by making an urgently-needed donation. Please show your support by clicking here to make a financial contribution! Make a donation now! Every dollar counts. Our organizers and volunteers greatly appreciate your continued support through this major transition. We look forward to seeing you at our office opening party in late March (TBA), and in the years to come in our new office!